A Future Start..., a photo by Nicole's Needlework on Flickr. ETA: The fabric I'm planning on using is 40 ct. Vintage Pearled Barley by Lakeside Linens. Les couleurs sont très belles et l'ouvrage sera certainement magnifique. Oh, that's going to be a beautiful sampler. What linen are you planning to stitch it on? Oh Nicole, this is a real beauty....I think you're leading me astray! For shame!! Beautiful colors and I love Pearled Barley! Oh those colors! They're gorgeous! Thanks for showing off what they look like! 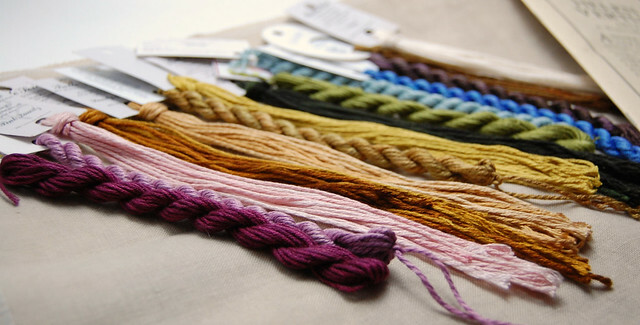 Those are beautiful fibers, such yummy colors. I'll be anxious to see your progress when you get started. And I love your progress on Sara. Looks lovely. Oh, soooooo beautiful! I keep coming back to look at the silks lined up. The silks and floss look so tempting. I wish I could reach through this screen and touch them. Wonderful project. What a pretty sampler, I like your colour choices too.